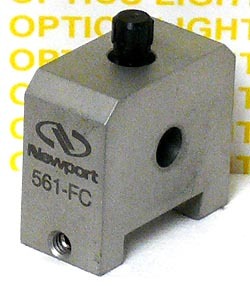 The Newport 561-FC Fiber Chuck Holder mounts onto the dovetail rail on Newport ULTRAlign linear stages. The through hole is meant to accept all .250 diameter fiber chucks. Like the rest of the ULTRAlign series, this is made of Stainless Steel.